Researchers found that the chemical concentrations increased in streams as a result of increased human land use within the watershed. Dr. Brad Austin, a postdoctoral researcher at the University of Arkansas, along with colleagues from the University of Arkansas and Bio by Design, monitored water quality throughout the Lake Wister Watershed in Eastern Oklahoma. Lake Wister is the primary drinking water source for over 40,000 people in Eastern Oklahoma. The lake is currently listed on Oklahoma’s 303d list of impaired water bodies for algal growth, pH, total phosphorus, and turbidity. This study was conducted to help the Poteau Valley Improvement Authority (PVIA) identify where best management practices should be to try to improve water quality. The researchers measured water quality each month for several years during baseflow across 26 sites in the Lake Wister Watershed. Water quality parameters were related to the total percent of agriculture and urban land use within the watershed. The study found a shift in water quality when the watershed had more than 25% agriculture and urban land use within the watershed. That is, concentrations of nitrogen, phosphorus, sediments, and algal biomass were greater in these streams. This “shift” is known as a changepoint, and the researchers used it to develop a tool that can help PVIA pinpoint areas in need of management (see the figure below for a conceptual example). 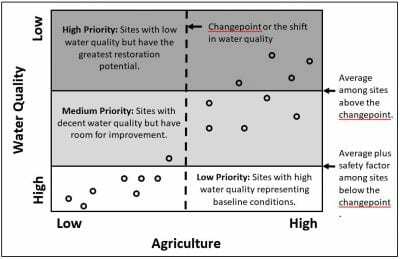 Conceptual framework for prioritizing watersheds in need of management based on water quality data and the land use changepoints. This research was published in the December 2018 issue of the Journal of Contemporary Water Research and Education (open access). 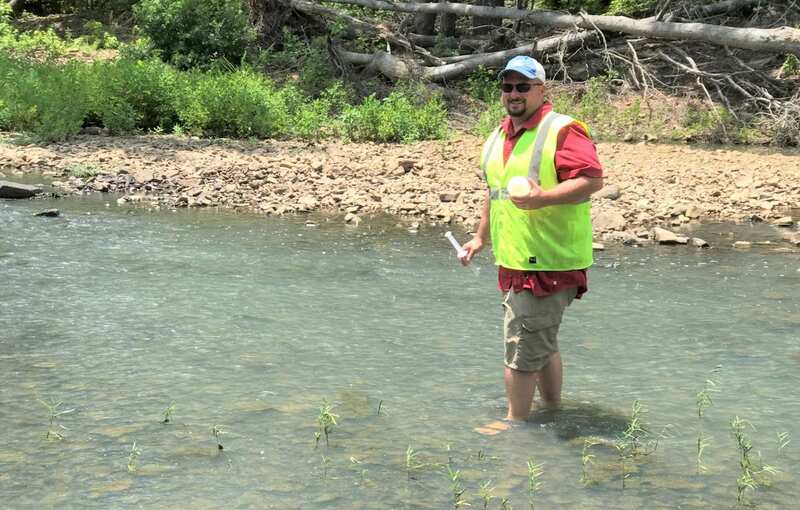 Photo: Dr. Brad Austin collects a water sample from the Poteau River Watershed in Oklahoma.